Each weekly class, held on Mondays and Wednesdays, costs $10 per session. Chair yoga is a gentle form of yoga that is practiced sitting on a chair, or standing using a chair for support. Frequently, the chair yoga student is unable to participate in a traditional yoga class due to the effects of aging or disabilities. 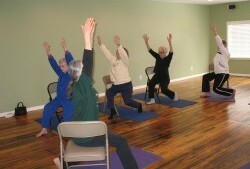 However, chair yoga is a great practice for everyone, as it deepens flexibility and strengthens personal body awareness. Studies have shown that gentle yoga and meditation may result in short term increase in dopamine levels, visible reduction in tremor, improvement in steadiness of gait, mobility, flexibility and quality of life, alleviation of depression, anxiety and fatigue, as well as possible increased energy, reduced stress, and improved sleep.